Longevity is a rare commodity in electronic music. It's a world where styles and trends can shift quickly, leaving artists who previously seemed adventurous suddenly resigned to the waste bin of nostalgia. That's why the multi- decade career of Richie Hawtin is so impressive - across his long list of aliases, he's managed to adapt his productions and performances to remain at the cutting edge, while never deviating far from his signature brand of precise, on-point Techno. This issue, we link up with Richie in Berlin to find out precisely how he's done it - pick up the mag now to read our extensive cover interview, along with a track by track breakdown of Plastikman's seminal Sheet One. 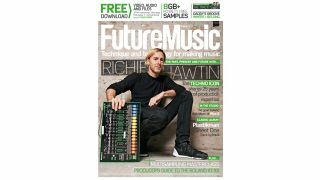 Also in this issue of FM, we delve in deep into the sonic capabilities of our favourite synth of 2015 in the Producer's Guide to the Roland JD-XA. Plus we help you unlock the creative potential of building and working with multisampled instruments - find out how in our essential guide. Stretched To The Limit - Heavily stretched sounds, from atmospheres to drum hits and loops. Add some stretched textures to your tunes. Filter Fun - Heavily filtered sounds and loops. We crank up the resonance, tweak the cutoff and get creative with modulation.